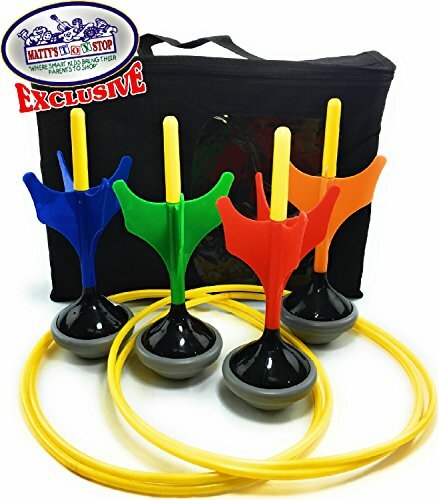 Deluxe Lawn Darts Set includes 4 colorful lawn darts (red, green blue & orange), 2 target rings & storage bag! Lawn Darts is a safe and fun way to entertain the entire family while getting them out of the house. Test your accuracy with an aerodynamic twist to the classic game of horseshoes that's designed to be played at the park, beach or backyard. During each round, 1 player from each team stands in the Toss Area and alternates tossing their 2 colorful darts at the target ring. The objective is to be the first team, or player, to score 21 points. The dart design features a built in safety tip to make this game even safer for the whole family. Created for both fun and safety, these Lawn Darts are back and better than ever! Set up your target rings and let em fly!